The Half Banded Loach has a distinctive "half band" patterning which makes this striking little fish a real eye catcher! The Half Banded Loach Schistura savona is a small fish that can reach between 1 to 4 inches (2.5 - 10 cm) in length, but is usually on the smaller side in the aquarium. It is also known as Bicolor Loach and Savona Loach. Like many of the Schistura species, it has a distinctive bold patterning that makes it quite appealing. The body background is a light white to golden color with fins and a tail that are light and translucent. It is marked with broad dark vertical bands, but only on the upper portion. There is a greenish brown cast or spotting along the center that creates a horizontal stripe appearance. Thus the common names Half Banded and Bicolor. This Bicolor Loach is a fairly hardy little fish that comes from cool fast-moving streams. Like other river loaches it is especially designed to cope with living in fast waters. 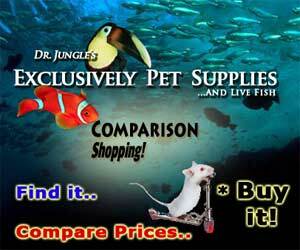 They will do best in a "river" type aquarium kept with good water movement and subdued lighting. They have been noted to rearrange the aquarium substrate by picking up bits of gravel and spitting it back out, so provide a sand or small gravel substrate. Be sure to provide plenty of hiding and resting places created with rocks and driftwood. Though not necessary, a moderate amount of plants can be a nice addition. This loach is an active yet peaceful fish. A small group of these loaches will make an attractive addition to a community aquarium. They enjoy the company of their own species and will do best in a group of five to seven, three is the suggested minimum to keep. The Half Banded Loach Schistura savona (previously Noemacheilus savona) was described by Hamilton in 1822. They are found in Asia from the eastern Himalaya Tista drainage at Darjeeling through Nepal, and to the Karnali and Kali drainages in Uttar Pradesh in India. It is also reported from Bangladesh. Other common names it is known by are Bicolor Loach and Savona Loach. The Bicolor Loach is listed on the IUCN Red List. Schistura savona is a widely distributed species with no major identified threats, hence it is assessed as Least Concern (LC). 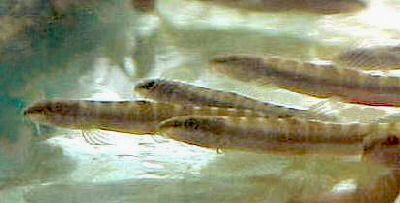 This Loach is found in main river channels and tributaries. They tend to stay in swift flowing clear stretches of rocky or gravely substrates. Their habitat is normally absent of aquatic plants. Their natural diet is presumably composed of benthic algae, insect larvae, and other micro organisms. The Half Banded Loach will get up to 4 inches (10 cm) in the wild, though in the aquarium it is usually smaller. This loach has a body that is slender, compressed and more or less cylindrical. The dorsal profile is arched and ventral profile is slightly concave. It has a small semi-circular mouth with a fleshy and furrowed lip that is notched at the middle. It has 3 pairs of barbels that are equal in size. The scales are small with overlapping edges, and are scattered all over body. The body color is a golden cream or yellowish-brown with 10 to 12 narrow vertical white bands along the entire length, but only on the upper portion. It has a complete lateral line and there can be a greenish brown cast or spotting along the center that creates a horizontal stripe appearance. The base of the caudal fin is black and the other fins are usually free from markings. There are small appendages on the pelvic fins and the tail or caudal fin is notched at the tip. Size of fish - inches: 3.9 inches (10.01 cm) - This fish can grow between 1 - 4 inches (2.5 - 10 cm) in the wild, it is usually smaller than 4 inches in the aquarium. The Half Banded Loach can be hardy under the right conditions. They are not recommended for beginners because of their need for pristine water and they do not have scales. Not having scales make them more prone to disease and very sensitive to medications used to treat disease. Experience in treating scaleless fish is very important to be able to give your loach a healthy and long life. The Half Banded Loach is an omnivore, and presumably feeds benthic algae, insect larvae, and other micro organisms in the wild. In the aquarium this loach will generally eat all kinds of live foods, sinking pelleted and tablet foods, flakes, and algae. They like frozen foods as well. To keep a good balance give them a high quality flake or tablet food everyday. Feed mosquito larvae, brine shrimp (either live or frozen), tubifex, daphnia, and some vegetable foods such as algae wafers. The Half Banded Loach will swim in the bottom of the aquarium. Because this loach does best in groups, a larger tank (ideally 30 gallons or so) will work best. The tank needs to have ample hiding places for this shy fish to retreat such as rocks, caves, and roots. They do best in soft, slightly acidic water. The tank setup for the Savona Loach should resemble its natural habitat, a flowing river. The substrate can to be a fine or medium gravel that does not have sharp edges. Larger smooth rocks, driftwood and branches should be added to provide shade and places for quick retreat. Java Ferns can be introduced and will attach to the decor. Powerheads or a rivertank manifold can be added to provide a unidirectional flow to simulate its natural habitat. Substrate Type: Sand/Gravel Mix - Substrate must be smooth. Same species - conspecifics: Yes - Likes to be in large groups. Groups of 5 or more are best. The Half Banded Loach are scaleless and prone to disease, so take caution when introducing these fish to an established tank. This loach is also very sensitive to medication to treat many diseases, a separate hospital tank is needed. Cold water and condition changes can also cause stress to this fish which makes them even more prone to disease. An outbreak of disease can often be limited to just one or a few fishes if you deal with it at an early stage. When keeping these sensitive types of fish, it is common to catch deteriorating water conditions and disease before other fish are affected. The best way to proactively prevent disease is to give your Bicolor Loach the proper environment and give them a well balanced diet. The closer to their natural habitat the less stress the fish will have, making them healthier and happy. A stressed fish is more likely to acquire disease. The Half Banded Loach or Bicolor Loach is occasionally available.